Leaker James Comey got triggered at a town hall Wednesday evening after Anderson Cooper called him out for leaking memos to the media. Anderson Cooper called Comey a leaker and insisted he leaked many times. “You did leak memos. I mean is it okay for somebody at the FBI to leak something, an internal document? Even if it’s not classified? Isn’t that leaking?” Anderson Cooper asked Comey. Comey wasn’t happy with Anderson Cooper. Anderson Cooper interjected which upset Comey. “One unclassified memo to the media and it’s really important–I was a private citizen, ” Comey shot back. 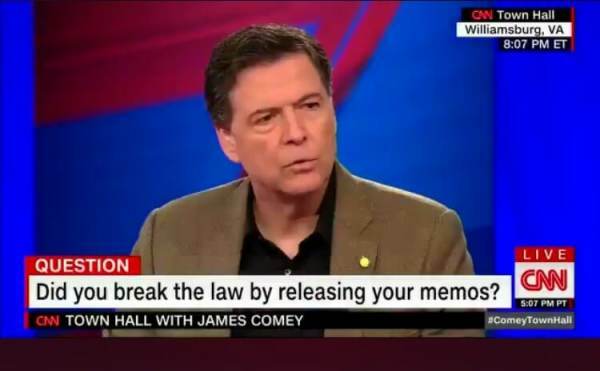 Anderson Cooper wouldn’t let up and insisted the memo was an internal document he had written while he was FBI Director and therefore it is a leak. At this point Comey tried to split hairs about what a leak technically is or is not, claiming a document has to be classified in order to be considered a leak. “Plenty of people leak non classified information”, Anderson Cooper said insisting Comey is indeed a leaker. Comey thought he would have an easy ride tonight with a CNN town hall, but Anderson Cooper brought a little heat!